Looking west at the Komatsu Bridge with a blue utility bridge and the Ogibashi Lock behind it. The lock was closed and so we had to turn around and paddle back to Kyu Naka Gawa on the Onagi Gawa. It would have been interesting to have been raised (or lowered?) by the lock while sitting in a canoe. The Komatsu Bridge is a single span Warren truss bridge built in 1930 with a big sidewalk on the east side of the truss. 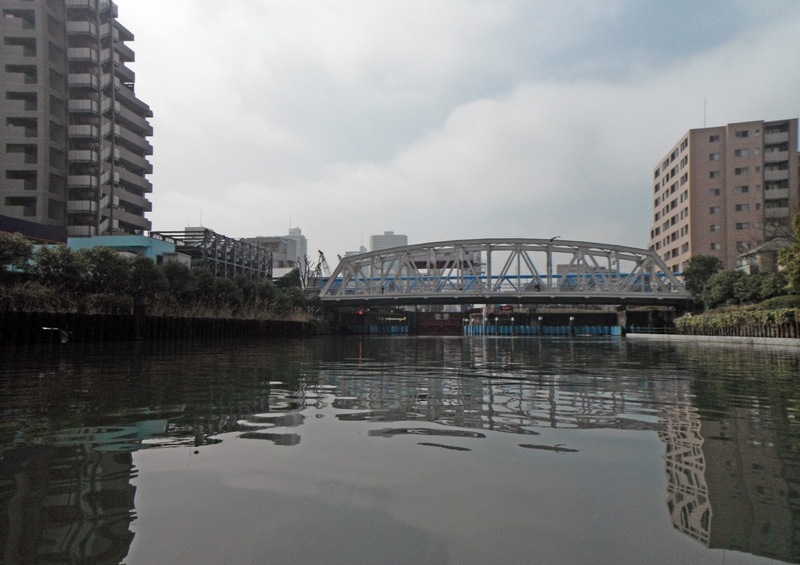 Tokyo, Japan's Bridges: Komatsu (小松橋) Bridge across the Onagi Gawa by Mark Yashinsky is licensed under a Creative Commons Attribution-NonCommercial-ShareAlike 3.0 United States License.